If you haven't signed up for an Oracle Database Service on the Oracle Cloud, you should do so right now. I wrote a white paper called "Integrating Application Express with PayPal PaymentsPro" about six years ago and also made available a corresponding application for download on OTN. The application still works as long as you configure it properly by supplying the right substitutions in the application properties, most notably your PayPal API developer username, password and signature. The reason for the public procedure is that the Classic PayPal API (formerly known as the NVP API) requires a redirect URL, which Pay Pal appends a token parameter and a PayerID parameter. The public procedure had two parameters of exactly the same name. 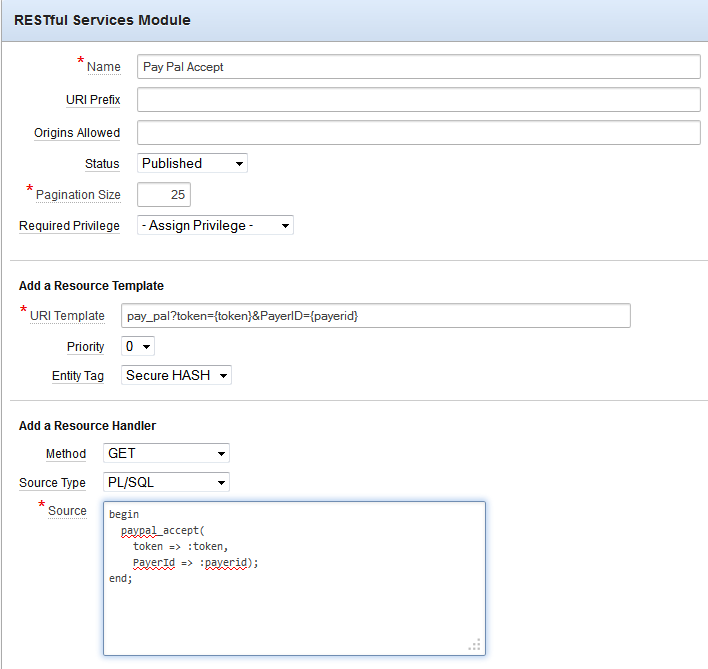 It occurred to me that what might work on the Oracle Cloud would be to create a RESTful service that would accept those parameters with exactly the same names. With help from another colleague, Colm Divilly, I was able to create such a RESTful resource template with a get handler. It also occurred to me that instead of using UTL_HTTP directly you could simply use the APEX_WEB_SERVICE API, specifically apex_web_service.make_rest_request. This package can be freely used on the Oracle Cloud, and it supports HTTPS calls through an instance wallet. On the Application Builder Home Page, Choose Import, and use paypal_installer.sql, do not choose to install supporting objects, you need to make changes to them and will install them later. a) API_USERNAME : This is the username you find at developer.paypal.com, click Applications, Sandbox accounts, and then Profile under the account that was initially created when you signed up for the developer account. (It should be Type Business. Upgrade it to Pro so that you can test the direct credit card payment feature.) On the profile window, click API credentials tab. Your username, password, and signature will be listed. Use this to fill out the substitutions of the same name. Replace above with your actual identity domain and ensure you don’t have and leading or trailing spaces in the fields, and that you have pasted the entire API signature, it will span multiple lines. Click Apply Changes. That’s it. The major changes were to create a RESTful service resource template and GET handler to handle the re-direct from PayPal, change the paypal_accept procedure to call f directly instead of redirecting to it, and to change do_post in paypal_api to use apex_web_service instead of UTL_HTTP directly. Now you are ready to test the application. You will be redirected to the PayPal sandbox site. You need to login using a Personal sandbox account you should have created way back in step 3 of the cookbook. Clicking continue should have caused you to redirect back to your RESTful services resource template, and you will now be back in your Application Express application on a confirm purchase page. Click Purchase. You should be on a Purchase Confirmed page now with transaction ID, order time and amount. Click Purchase More Tickets. Use the Account type you created when creating the Sandbox personal account. You get the account number and expire date from the Funding tab of the account profile. Enter the expire date in the form MMYYYY no spaces, no dashes. Click Pay Now and you should be back on the Purchase Confirmed page. You are now ready to accept payments in your database service Oracle Cloud applications. You simply change the API_URL substitution in Application Properties to point to the production PayPal API URL. button, and then on the Application Express in Oracle Database 12c heading. I wrote in my previous post that you cannot patch the Application Express 4.2 version in a Oracle Database 12c container database to 4.2.2.00.11, however as of a little while ago, you can now remove Application Express 4.2 from your container database and install Application Express 4.2.2.00.11 as a new install. The apex_4.2.2.zip and apex_4.2.2_en.zip files have been updated on OTN to include the appropriate _con.sql scripts used for installing into a container database. Download or re-download either apex_4.2.2.zip or apex_4.2.2_en.zip from OTN. Old distributions will not work and will not have the proper scripts. Unzip apex_4.2.2[_en].zip and cd to the apex directory. Connect as SYS as SYSDBA to the CDB$ROOT container of your container database. Run apxremov_con.sql as described here the only difference is you will be using apxremov_con.sql from this distribution and not from the $ORACLE_HOME/apex directory. Exit SQL*Plus, and reconnect as SYS as SYSDBA to the CDB$ROOT container. Run apexins_con.sql or apxrtins_con.sql from the updated 4.2.2 distribution depending on the type of install you want, similarly described here. Ensure you are still connected to the CDB$ROOT container as SYS and run apex_epg_config_con.sql passing the path to where you unzipped apex_4.2.2[_en].zip. Change your container to the PDB that you want to be an Application Express instance and then run apxconf.sql as described here. Use apxconf.sql from the 4.2.2 distribution, not the one in $ORACLE_HOME/apex. Note that until database patch 16946990 is available you will not be able to install Application Express locally in a PDB as described here. The instructions above however will allow you to install Application Express 4.2.2.00.11 as a common option in the container database. Recently I assisted a colleague (with much help from Marc Sewtz) that wanted to send an Excel document attached to an email showing new customers on a scheduled basis. Seemed like a reasonable request since APEX_MAIL has had attachment support since 4.1 (thanks to Joel) and APEX_UTIL.GET_PRINT_DOCUMENT can get a BiPublisher report as a BLOB. In assisting my co-worker I learned at least three nuggets about accomplishing this feat. You cannot use GET_PRINT_DOCUMENT Signature 2 or 3 which accept the name of the report defined already in an application in a scheduler job. You must use either Signature 1 or 4 that allows you to pass in both the report data and the report layout. DBMS_XMLGEN which allows you to generate XML based on query escapes special characters using & notation. The BiPublisher convert servlet will choke if it receives data that contains an &. You must do your own escaping in the query itself to make sure DBMS_XMLGEN won’t produce a document with an ampersand in it. In order to get an Excel document using GET_PRINT_DOCUMENT Signature 4, you must use ‘Excel’ for the p_document_format parameter, not ‘xls’ as the documentation suggests. Armed with these three nuggets, let’s use the Sample Database Application to schedule an Excel document based on the orders table to be emailed to us. Since I have BiPublisher available to me I am going to use the BiPublisher Word plugin to create a rtf template for my report layout. I find it much easier to use than trying to create an xsl-fo template. To use this plugin, I get the XML data for my query by creating a Report Query in shared components and then click the Download button. Now I load the data into the BiPublisher Word plugin and run the table wizard to create a simple table. The result looks like the following picture. I save the document in rtf format, and then open the document using a text editor. I build a local string up in my procedure SEND_ORDERS described and listed next. SEND_ORDERS uses DBMS_XMLGEN to create the XML data that is passed into GET_PRINT_DOCUMENT. The report layout that is passed in is built up in the procedure using the text that makes up the rtf document. Once I get the blob back from GET_PRINT_DOCUMENT, I simply attach it to an email using APEX_MAIL. create or replace procedure "SEND_ORDERS"
I test the procedure from SQL Commands and then create the scheduler job using DBMS_SCHEDULER. And finally, I test the scheduler job using DBMS_SCHEDULER.RUN_JOB. Now of course you can adapt this example to use Apache FOP and an xsl-fo style template if you don’t have access to BiPublisher, but that is an exercise left to the reader.